I wanted to create a story of exotic romance, something that evoked longing, something deeply masculine and feminine at the same time, something raw. So, I planned this styled elopement shoot along the coast of Spain! I had never been to Spain (or outside of the US for that matter), but I had a story I wanted to tell and it needed to be in that tiny city in the northeastern part of Spain. I planned every detail from the US, packed a suitcase full of details and dresses (there was no room for much else) and met the sweetest florist in Barcelona! I then carried the bouquet a few miles on foot in the misty morning through the quiet streets of Barcelona, then we took a 3 hour bus ride, followed by a little trek through the cobblestone streets of Cadaques. The city greeted us with a foggy late afternoon haze, I went to take a photo from our breathtaking view of the port, and my camera malfunctioned. I traveled all this way and my camera chose that time to fail me! After chatting with tech support, I learned that one of the following would happen: my camera would turn on again and be fine or it would never turn on again. I sat on the edge of my bed for what felt like an eternity, cleaning each component, blowing dirt and dust out of all of the crevices, changing every battery and part I could. After some deep prayer and cleaning, lucky for me, my case was the former! My camera was alive!! I still was hesitant to use it and mostly used my iPhone and film camera for my vacation shots, but needed to save my camera for the shoot the following day! 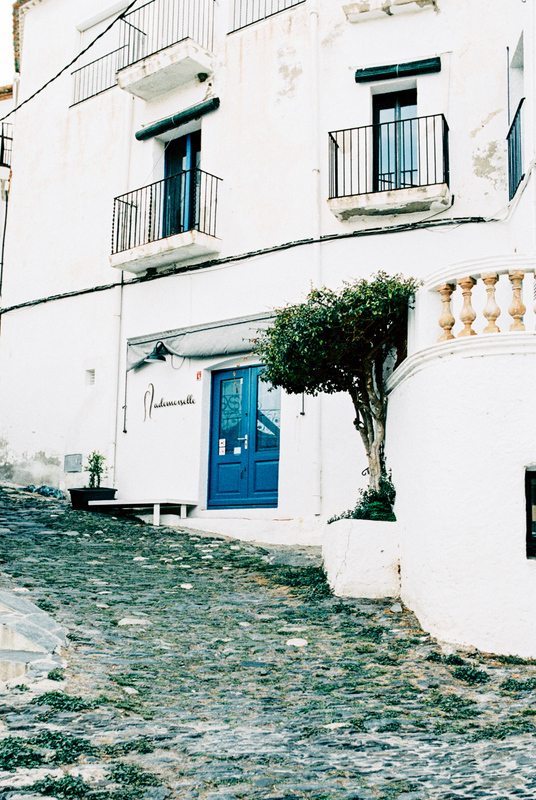 So here is a tale of two lovers who find themselves in the French-Catalan town of Cadaques, their elopement is simple, just the two of them. He is casual, body covered in tattoos and piercings, a modern Zeus. She is soft, feminine, my Aphrodite. Their story begins with excitement in the port of the city where they share their vows and as the sun sets behind the peaks of the surrounding mountains, the earth lit up like fire, a golden kiss from mother nature to bless their wedding story! Then, after a light dinner, they make their way to the beach together for romantic walk, the wind from the sea whipping around them. I'm so grateful that this story was able to be told and that I was able to create it with the help of some talented vendors stateside and abroad!